Annyeong! MyCarForum is offering giveaways for all car grooming enthusiasts! Grooming your ride is already a tedious chore. Finding an available washing bay, then washing, claying and polishing your car in our sunny island can be quite tiring! But luckily, Bullsone has recently reached our shores and they would like to make your car grooming experience a pleasant one. Not only that, they also have a quality product that ensures your car achieves a veneer-like condition! Bullsone Singapore is giving out car care products for MCF members to give it a try! You may choose 2 out of these products and you will also receive 1 bonus product (total worth up to $56)! We will arrange the items to be collected at the sgCarMart office, or a meet up at Kallang Leisure Park. You can choose your preferred venue and collection timing at the registration page. 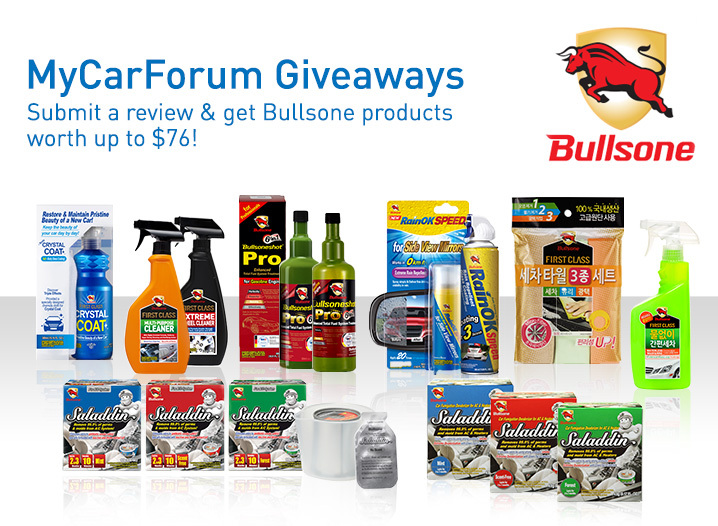 For the first 30 members who have written a review, we will also be giving away Bullsone Bullsoneshot Pro (worth $19.90), a deep cleaning fuel additive that is proven to clean and protect your engine from harmful deposits! Join us now by selecting your most desired Bullsone product! Our admin will drop you a PM to confirm your entry! Do check you PM frequently! Have fun grooming your car with Bullsone! After payment is completed, kindly self-collect the item at venue and date that you have chosen. Those who have submitted 2 product reviews at pages above may claim a Bullsoneshot Pro - Enhanced Total Fuel System Treatment for Gasoline Engine 500 ml worth $19.90! The total worth of items a member could claim for this giveaway is up to $76! Edited by spzen, 26 July 2017 - 09:18 AM. SEE Video for Bullsone Crystal Coat featuring Girl's Day! DIY Glass Coating for your car at only $21.90! Get a super glossy finish on your car with rain repellant effects! may i ask, for the bonus product. is it randomly chosen or we can specific request to our need? Maybe we should organise a mega DIY car wash with Bullsone for those who have gotten the products! hahahah! Hhaha. Won't lah. We sure will help one leh. MCF members all steady one. haha. I just upgraded to premium. For selected premium members who have completed the payment, you may collect your Bullsone items at venue & timing you have chosen during the registration! I just collected the Crystal Coat & RainOk. Only saw Pchou, didn't get to see the Korean girls at all .